Trailer Park: "The Three Stooges"! Anyone can tell you if a trailer "looks good" or not. But Drew Magary, who spent over a decade working in advertising, is here to tell you whether or not a trailer WORKS. This week's trailer? "The Three Stooges". The Farrelly Brothers' "Three Stooges" movie has been in development for so long that it's shocking to see actual footage of the movie. It's the "Chinese Democracy" of comedy retreads. Here is a partial list of everyone who had been considered for the one of the Stooge roles at some point : Sean Penn, Andy Samberg, Johnny Knoxville, Jim Carrey, Paul Giamatti, Hank Azaria, James Marsden, Benicio del Toro (really? ), and countless others. It's been over a decade in the making. And now, at long last, the trailer is here, with Will Sasso, Sean Hayes, and Chris Diamantopoulos as your headliners. Let's take a look at the trailer and see if this thing is more Curly than Joe. Does the trailer let us know what the movie's about? Listen, if you need a trailer to help explain what "The Three Stooges" is gonna be about, you're probably not ready for the complexities of Stooge-based humor. Yes, the trailer tells us everything we need to know. 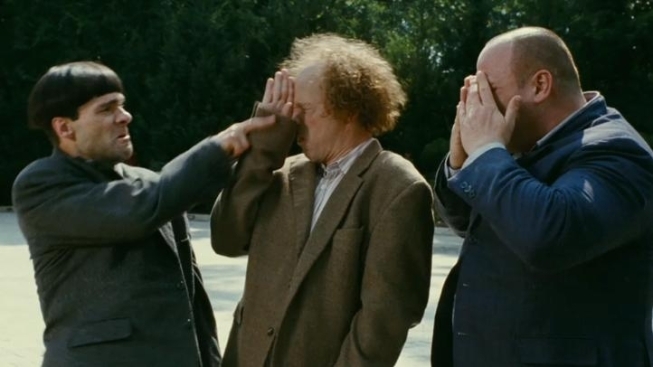 There are three stooges and they poke each other in the eye a lot. Also, it's clear from the trailer that the Farrellys have left the tone of the original shorts unchanged. From the eye-pokes to the hammed up sound effects, they stayed true to the original. Whether or not that's a good thing I leave up to you (pokes you in the eye while you think it over). Is Sasso a convincing Curly? I guess so. I say that only because it's pretty clear that he's "doing" Curly. But seriously, what else is Sasso supposed to do? Is he supposed to go all Heath Ledger and make Curly his own? I don't know how you would even begin to do that. Is Hayes a convincing Larry? He gets the least amount of screen time in the trailer, so it's hard to gauge. But he does have the hair. Is Diamanwhathisname a convincing Moe? Yes. The voice is pretty much spot on. Does the trailer do that thing where you think it's a serious movie at first, only to reveal ten seconds in that it's a silly comedy? It does! Boy, that trick always gets me! I never would have known it was a Three Stooges film, apart from the fact that I'm at the WEBSITE FOR THE THREE STOOGES MOVIE. Are there are all sorts of horrible punny taglines for the movie? Yep. There's GET SOME MOE, which is clever, and JUST SAY MOE, which is even more clever! I suggest the next tagline be READY SET MOE. Is that a nunkini? It is. It's mesmerizing. I watched the trailer three times just for that. Is that a Snooki cameo? Yep. Because any comedy worth its salt has a Snooki reference in it. Just like the original did! Does this trailer work? No. This is basically the Farrellys taking the old Stooge bits and recreating them note-for-note. Why would I watch them do that when I can just watch old Stooge shorts at home? Throwing Snooki into the mix doesn't make it any newer or fresher. No wonder it took so long to get this movie made: it doesn't have any legitimate reason to exist. Except for the nunkini. That's crazy hot.